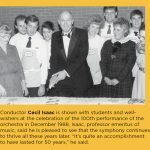 In fall 1966, Austin College professor Cecil Isaac gathered fellow musicians from the College and the surrounding community to play through Beethoven’s First Symphony. A love for symphony music kept the musicians coming back each week. 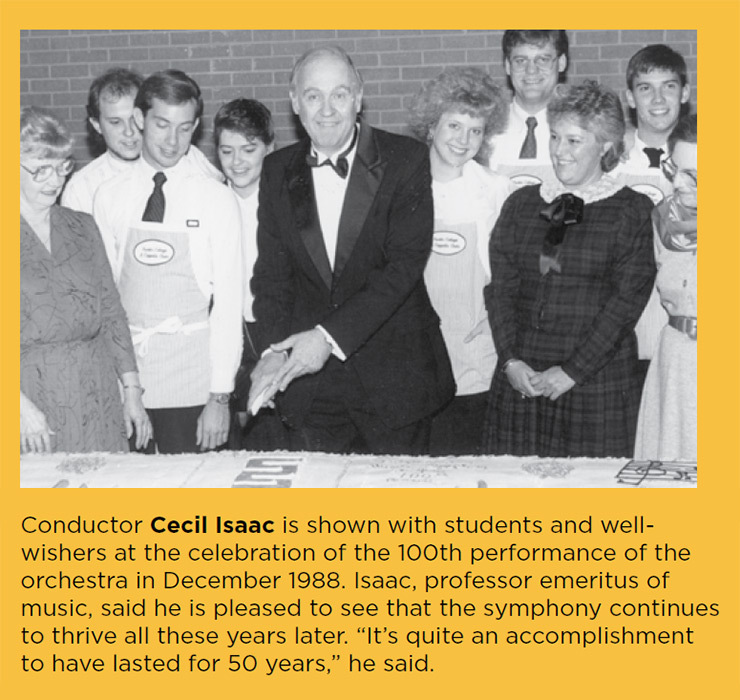 From that love of music and the dedication of Isaac to bring musical culture to the community, the Sherman Civic Orchestra was born, with Isaac as conductor. 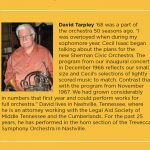 What is now known as the Sherman Symphony Orchestra has been making beautiful music ever since—this year celebrating 50 seasons. The Golden Season will be celebrated April 30 at its spring concert when more than 70 musicians, including two harpists and three timpanists, perform Holst’s “The Planets” in Kidd-Key Auditorium at the Sherman Municipal Building. 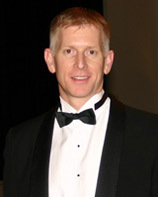 Daniel Dominick serves as the symphony director today, as he has since coming to Sherman in 1992 to join the Austin College Music Department faculty and lead the symphony. 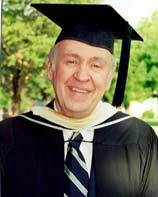 In his nearly 25 seasons, he has continued the fine presentation of music by great composers. 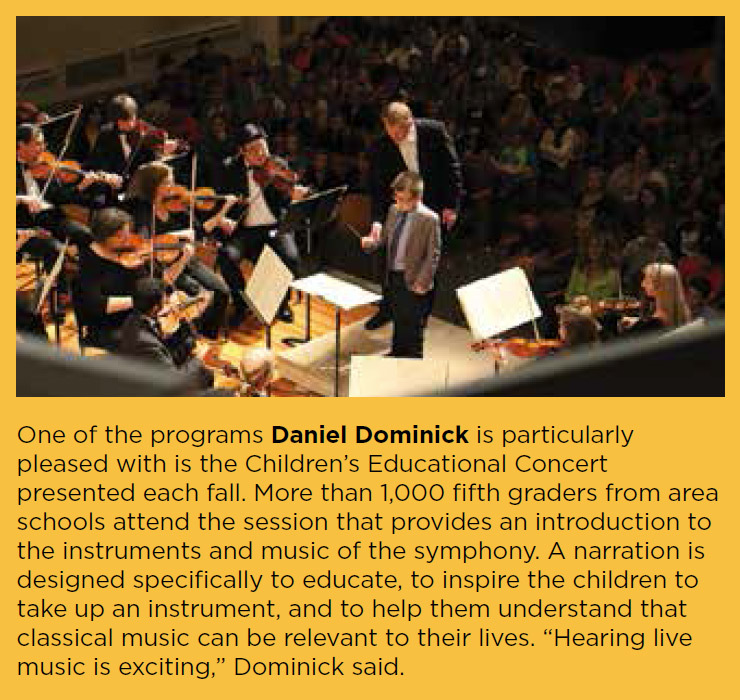 Dominick, too, is devoted to the orchestra, what it offers Austin College students, and the cultural options it offers the people of Grayson County and surrounding communities of North Texas and Oklahoma. 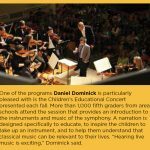 “Through the Symphony Orchestra, the local community is able to enjoy high-level, classical performance,” Dominick said, noting that the full orchestra offers a different kind of musical experience than other bands or ensembles. 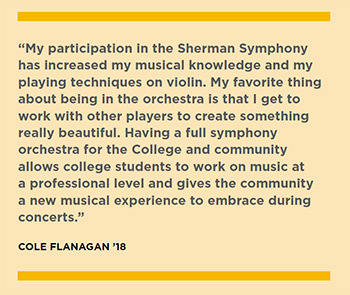 The symphony also offers great opportunity for Austin College students, both in the chance to perform and the instruction that comes from playing alongside other talented and dedicated musicians. And, of course, the presence of the Sherman Symphony Orchestra is a part of the cultural community that helps to attract and retain businesses and other opportunities for the region. The orchestra regularly includes 65 players—all volunteers participating for the love of music—and 12 to 20 of those typically are Austin College students. Another 10 players come from other area colleges and a few high school students participate. Community members and area faculty make up the remainder of the orchestra. Professional musicians are hired if a particular musical piece requires instruments not performed by area musicians, but the orchestra is always based upon the volunteers; professionals only augment. And that’s just the way Dominick likes it. “I’d take a performer who loves to play and loves music over the professional just playing another gig any day,” he said. The orchestra normally practices only two hours a week, with an extra evening’s practice and a pre-concert run-through on performance weeks. That means they have to be efficient with their time and select a program that is challenging and exciting but that can be perfected within their rehearsal time. The orchestra base can play almost anything, Dominick said. The beautiful music continues—on April 30 and for many seasons to come. 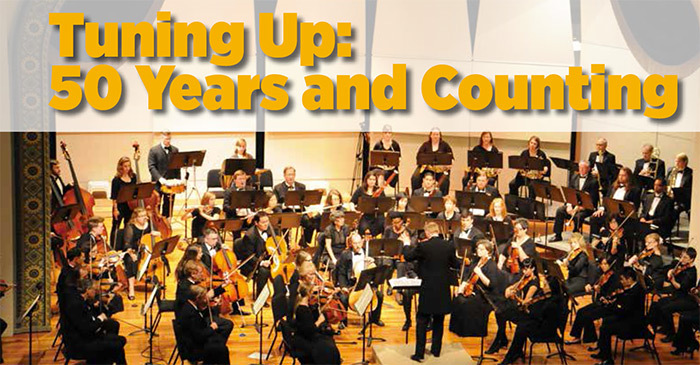 Past members of the symphony are encouraged to join the April 30 celebration; contact Lori Allen in the Music Department at 903.813.2251 or lallen@austincollege.edu for information. 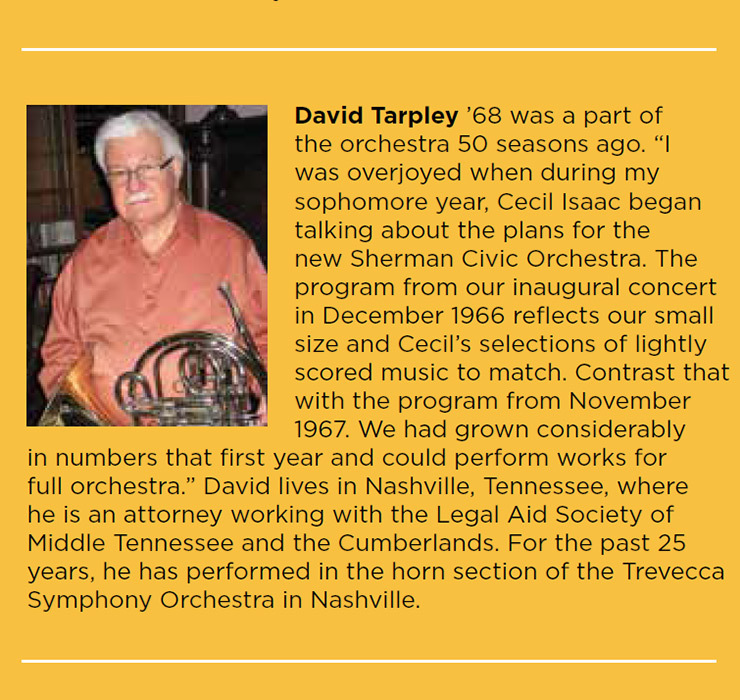 Read the Reflections by David Tarpley.